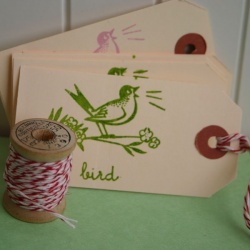 Pretty up your packages with these hand silkscreened Bird shipping tags. This set comes complete with 6 shipping tags (3 green, 3 pearlized pink) and 3 yards of twine (on a vintage wooden spool). Other Info Each tag measures 3 3/4" X 1 7/8"